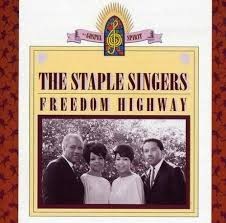 In 1965 The Staple Singers again moved to a new record label, Epic Records. They continued to record in their distinctive bluesy gospel style, though they were now including more protest songs in their repertoire, becoming popular as part of the civil rights movement. In 1967 they had two singles scrape into the Top 100, the first being their own "Why (Am I Treated So Bad?)" and the second being a cover of Stephen Stills' "For What It's Worth". This extensive compilation contains thirty-three songs from their Epic years (though it doesn't contain every last recording). Disc 1 is actually the 1991 CD compilation Freedom Highway, and Disc 2 is compiled from a variety of more obscure sources. Includes a wonderful reading of Hank Williams' "Be Careful Of Stones That You Throw", an obscure early Bob Dylan number ("John Brown"), as well as many familiar traditional titles such as "Will The Circle Be Unbroken", "Wade In The Water", "Mary Don't You Weep" and "Nobody's Fault But Mine". Like on The Riverside Years, these songs benefit from a clean, well-produced sound, but retain all the original grit and honesty of their earliest recordings. Many of the songs ("For What It's Worth" being the most notable example) suggest a move towards a more mainstream pop sound, with the instrumental backing a little more full-sounding, but Pops Staples' guitar is still the driving force throughout.